The following is the text of an IBM Data Processing Division press fact sheet distributed on October 5, 1959. 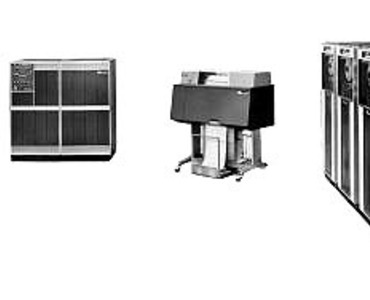 The all-transistorized IBM 1401 Data Processing System places the features found in electronic data processing systems at the disposal of smaller businesses, previously limited to the use of conventional punched card equipment. These features include: high speed card punching and reading, magnetic tape input and output, high speed printing, stored program, and arithmetic and logical ability. The elements of the basic 1401 system are the 1401 Processing Unit, 1402 Card Read-Punch, and 1403 Printer. Configurations include a card system, a tape system, and a combination of the two. The 1401 may be operated as an independent system, in conjunction with IBM punched card equipment, or as auxiliary equipment to IBM 700 or 7000 series systems. The 1401 performs functions previously requiring a number of separate machines: card reading and punching, separation of output cards, calculating, and printing. As an auxiliary to large scale data processing systems, the 1401 performs magnetic tape sorting and editing, card-to-tape and tape-to-card operations and high speed printing. The larger system is thus made available for data processing and logical operations. New simplified programming techniques make the 1401 extremely powerful and more efficient than many other systems of comparable or even larger size. Variable length data and program instruction words provide maximum utilization of the magnetic core storage; there is no waste of storage capacity as with fixed record length systems. Program steps may be skipped or reread in any desired sequence, a feature which greatly increases programming flexibility. With the 1401, manual control panel wiring is eliminated, and transfer of cards or paper between machine units is greatly reduced. The 1401 incorporates the building block principle, providing for expansion and a variety of configurations to fit the needs of individual users. This unit controls the entire system by means of its stored program. It performs the arithmetic and logical functions, controls card reading and punching, magnetic tape input and output, and tells the printer what to print and where to print it. The 1401 automatically edits the systems printed output for spacing, punctuation and format. The 1401 is available with 1,400; 2,000; or 4,000 positions of core storage. Alphabetical or numerical data may be processed. Speed: In one minute, the 1401 Processing Unit can perform 193,300 additions (eight-digit numbers) or 25,000 multiplications (six-digit numbers by four-digit numbers). The 1402 reads card information into the processing unit, punches cards, and separates them into radial stackers. The cards can easily be removed while the machine is running. Maximum speeds are: punching, 250 cards per minute; reading, 800 cpm. Reading and punching can be performed simultaneously. The IBM 1403 Printer is a completely new development providing maximum "thru-put" of forms and documents in printing data from punched cards and magnetic tape. The printer incorporates a swiftly moving horizontal chain (similar in appearance to a bicycle chain) of engraved type faces, operated by 132 electronically-timed hammers spaced along the printing line. The impact of a hammer presses the paper and ink ribbon against a type character, causing it to print. The chain principle achieves perfect alignment of the printed line and greatly reduces the number of sets of type characters needed. The 1403 prints by means of a scanning operation which compares characters on the chain with characters in storage designated to be printed. When a character on the chain matches the one in storage, the hammer for that printing position is fired. The chain of engraved type faces moves across the face of forms or documents at a constant speed of ninety inches a second. Two interchangeable type styles are available for the chain. An outstanding feature of the printer is the exclusive Dual Speed Carriage, which has the ability to skip over blank spaces on forms and documents at speeds far in excess of normal printing rate. This carriage skips the first eight lines at thirty-three inches per second, and beyond eight lines at seventy-five inches per second. Combined with a printing speed of 600 lines per minute, the result is a higher rate of output than is obtainable with many printers of greater line printing speed. The 1403 Printer can produce over 230 two-line documents, such as checks, per minute. This is equivalent to a printing speed of 4,800 lines per minute. All electronic and logical operations of the printer are under the stored program control of the 1401 Processing Unit. Information to be printed is read into storage from the input cards or magnetic tape, processed, and read out to the Printer. A feature of the Printer is a wheeled form stand which reduces and simplifies paper handling. Up to six IBM 729 Magnetic Tape Units (Model II or IV) may be added to the 1401 system for increased input, speed, and storage compactness. These are the same all-transistorized tape units used with the IBM Series 700 and 7000 data processing systems. Either single or double density tapes are specified to provide processing speeds of 15,000 or 41,667 characters a second with the 729 II; 22,500 or 62,500 characters a second for the 729 IV. The 1401 can also be linked to an IBM 1210 Model 4 Sorter-Reader for direct processing of paper documents imprinted with magnetic ink, providing banks with a system for mechanizing bank demand deposit accounting and account reconciliation, transit operations, installment and mortgage loan accounting and other banking functions. Payroll: The speed of the 1401 system is an asset in payroll processing. Payroll registers, check and earnings statements and deduction registers are prepared at speeds up to 600 lines per minute. The system will accumulate regular and overtime hours and gross earnings for each employee, check each employee's accumulated total hours and dollars, and print a daily performance record. The 1401 consolidates these payroll operations and performs them at greater speeds than present systems. Railroad freight car accounting: The power and capacity of an IBM 1401 Tape System enables sorting, rearranging and processing of source data to be done automatically without maintaining voluminous punched card records. Source document data is recorded directly on tape, and repetitive handling and processing of records is eliminated. Greatly reduced file space, current daily information, and reduced operating expenses are among the advantages to railroad users. Public utility customer accounting: The IBM 1401 provides the medium and smaller size public utility with an integrated operation for customer billing and accounting, starting with the application for service, continuing through the final bill, and including all records having to do with the utility customer and his premises. Some of the advantages of a 1401 Tape System to the utility are: daily updating of the entire accounts receivable file, with all cash balanced and posted on a daily basis; daily preparation of an open-item accounts receivable register, collection follow-up notices and automatic preparation of mark-sense meter reading cards as a part of the normal maintenance of the master file. Merchandising: Decision making for merchandise control in the retail industry is a significant area for processing on the 1401. By highlighting increases in inventories and markdowns, slow-moving items can be brought to the attention of executives. Improved buying and distribution in a competitive market will be made possible by showing the effect of all transactions in a few integrated reports. Sales figures from previous weeks as well as last years figures will appear on the same reports that show the current statistics, enabling management to give attention to areas that are in difficulty. With the 1401, retail executives and merchandise managers can take advantage of faster, more accurate reporting. Accounts receivable for retailers: The speed of an IBM 1401 Tape System and its exceptional file maintenance abilities make it well suited for handling merchandise control as well as all accounting and statistical requirements for retailing. Some of the major advantages to medium and large departments and specialty stores are tight controls to assure accuracy of customer statements, complete up-to-date credit information and ability to handle peak loads without sacrificing schedule or taking on a large temporary staff.